Oxford University Press, USA, 9780195123326, 416pp. This handy reference provides full access to the 1,200 years of Roman rule from the 8th century B.C. to the 5th century A.D., including information that is hard to find and even harder to decipher. Clear, authoritative, and highly organized, Handbook to Life in Ancient Rome provides a unique look at a civilization whose art, literature, law, and engineering influenced the whole of Western Europe throughout the Middle Ages, the Renaissance, and beyond. The myriad topics covered include rulers; the legal and governmental system; architectural feats such as the famous Roman roads and aqueducts; the many Roman religions and festivals; the Roman system of personal names; contemporary poets and historians; even typical Roman leisure pursuits. Each chapter includes an extensive bibliography, as well as more than 125 site-specific photographs and line drawings. Maps chart the expansion and contraction of the territory from the foundation city of Rome itself to the Byzantine Empire and the ultimate decline of the West. 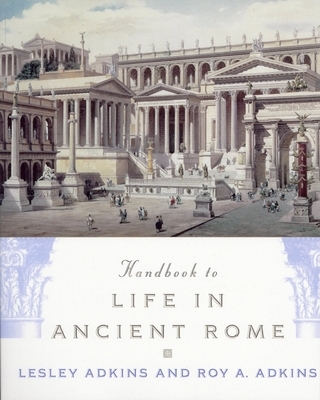 Combining both archaeological and historical evidence, the Handbook to Life in Ancient Rome is perfect for anyone interested in Roman history, the classics, or an overview of the amazing period in which the Romans ruled. Lesley and Roy A. Adkins are both professional archaeologists. They have written numerous books together including Dictionary of Roman Religion, An Introduction to Archaeology, and Handbook to Life in Ancient Greece.